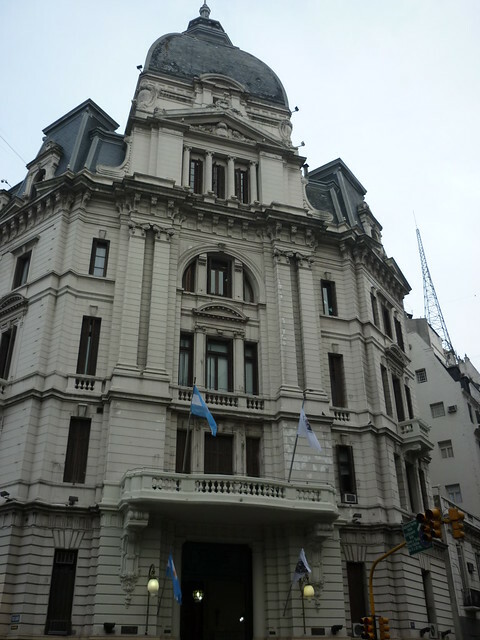 The one thing that really awed me about Buenos Aires was the beautiful architecture. It was everywhere. Walking around downtown, it seemed like everywhere I looked there was an impressive building. Here in Santiago, we have a few architectural gems, but unfortunately, due to the seismic nature of the country, most of them have been destroyed over the years. So Buenos Aires definitely wins in the architectural department. Here are some of my favorite buildings and statues. 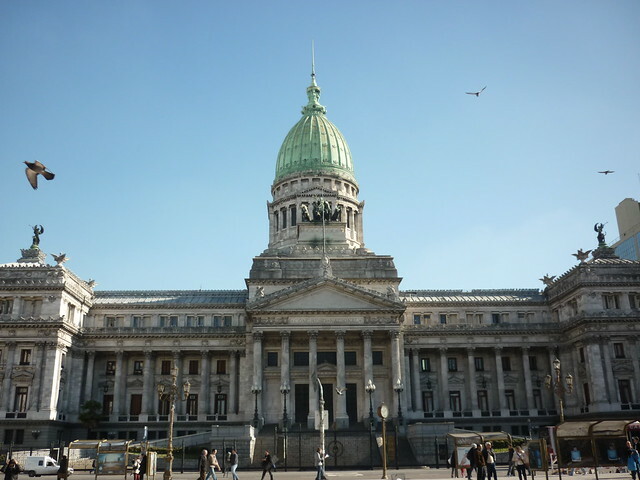 This is the Congreso, the National Congress building. It was exquisite. I know nothing about architecture, but I know that this building was gorgeous. I loved all the intricate details and the chariot of horses near the dome. 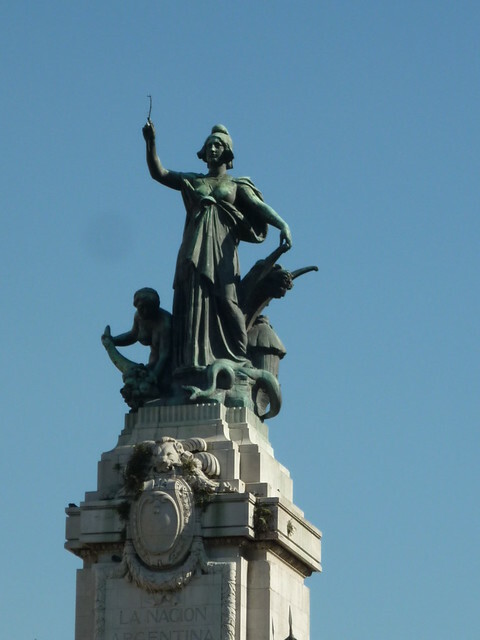 This is just one part of an impressive looking statue that was in front of the Congreso. This statue is on the front patio of the Casa Rosada, where the President of Argentina works (not lives, the same as the Moneda Palace in Santiago). The side of the Casa Rosada that you always see in pictures (see below) is actually the back. 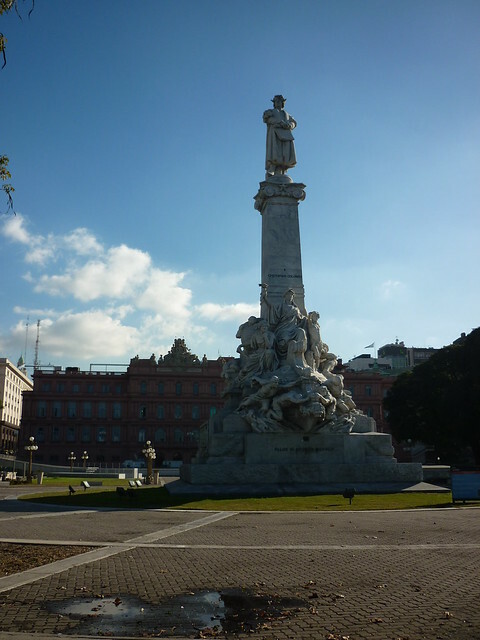 The front is all gated off, but on our walk to Puerto Madero, we discovered this impressive statue to Cristopher Colombus, aka Cristobal Colón in Spanish, aka Cristoforo Colombo in Italian, which was what was written on this statue. (Figures, there is a HUGE Italian influence in Buenos Aires). Colombus is quite a controversial figure, and I won’t get into that here, I just thought the statue was worth photographing. Taken from the Plaza de Mayo, this isn’t my best picture of the Casa Rosada, but it’s the only one that demonstrates a peculiarity about the building: it’s not symmetrical! Annoying! Although it wasn’t one of my favorite buildings architecturally speaking, I still liked it and its pink color is definitely distinctive. Plus, if you’ve ever seen Evita, you have to go see the Casa Rosada. 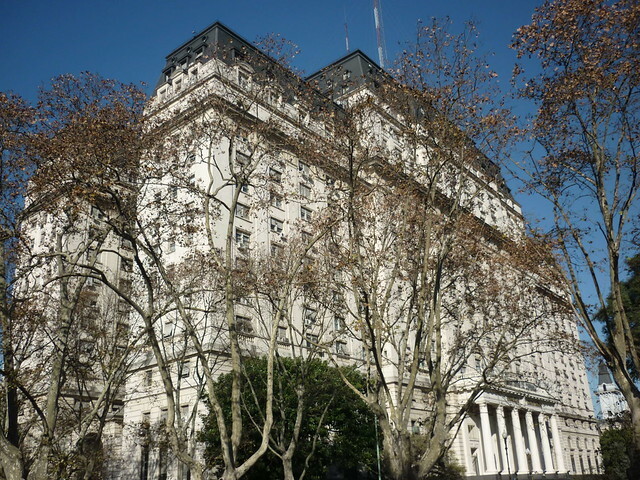 The balcony where Eva Duarte de Perón (and Madonna in the movie) addressed the crowds is on the left, right above the CI in DEMOCRACIA in the picture. The shooting of the film in Argentina was very controversial, and the Argentinean authorities didn’t want to grant permission for the cast and crew to use the Casa Rosada in the film. However, playing upon President Carlos Menem’s ego, the producers arranged a meeting with Madonna in return for being able to use the balcony for that famous scene. I’m not even sure what these last buildings were, but they were pretty, so I took pictures. I loved just walking around Buenos Aires and seeing these building everywhere. I think that is one of the reasons that people call Buenos Aires “the Paris of South America” or say that it’s a European city. I definitely got that vibe. 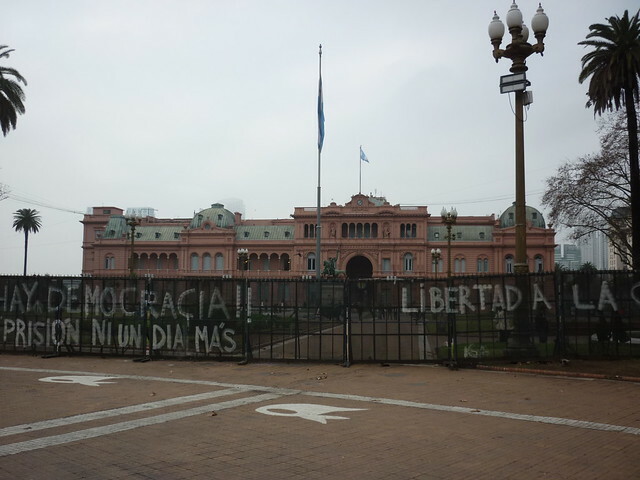 This entry was tagged Architecture, Buenos Aires, Casa Rosada, Congreso, Evita. Bookmark the permalink. The penultimate photo is the Anchorena palace – a private home when it was built believe it not. It’s now called Palacio de San Martín and it’s the Foreign Office. 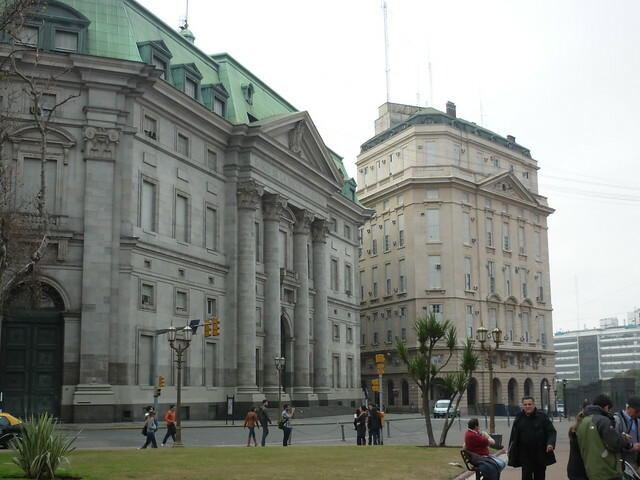 The last one is the Jefatura (the Mayor’s office), on the corner of Plaza de Mayo and the Diagonal Norte. There are normally fancy guards on the door, but they must have been having a day off! Thanks Jonathan! I think there were fancy guards at the door, I just cut them off in the picture. Oh, gorgeousness … I so want to be there. You have to go! BA is so pretty! I used to live right around the corner from el Congreso. (My boyfriend is still there and gets to hear the numerous protests seemingly every other day.) Your posts were great and made me miss BsAs so much! I’m glad you had a good time and finally got to see the city! Good luck with everything back in eeuu!! Thanks Renee! I was pleasantly suprised by BA and the Congreso was definitely a highlight.